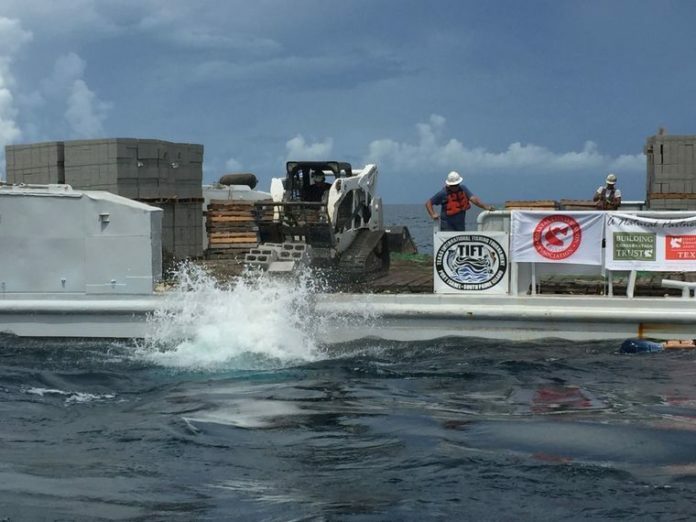 In this July 7 photo, cinder blocks are pushed over the side of the Vietnam-era landing craft Lil Mo for the RGV Reef, 8 miles off South Padre Island and 25 percent complete. The reefing project is aimed at boosting the population of red snapper and other game fish. SOUTH PADRE ISLAND — The RGV Reef is about a quarter of the way done and, according to marine biologists, already teeming with juvenile red snapper and schools of bait fish. So says Gary Glick, president of the nonprofit group Friends of RGV Reef, formed in 2015 with the goal of creating a 1,650-acre artificial reef off the coast of South Padre Island to substantially boost the local population of red snapper and other game fish. To date the project has sunk two boats (a shrimp trawler and a tugboat) and roughly 4,000 tons of low-, medium- and high-relief material at the site, eight nautical miles off the coast and 14 nautical miles north of the Brazos Santiago Pass jetties. That material includes concrete pyramids, rip-rap, and box culverts weighing 26,000 pounds a piece, as well as 20 truckloads of concrete roof tiles. According to scientists studying the project, in two years the amount of reef already deployed will have added 60,000 to 240,000 adult red snapper to the waters off South Padre Island, Glick said. “We need to do this four or five more times and we will then have something that will begin to approach what they’ve done in Alabama, which throws off $50 million to $60 million of economic impact every year,” he said. Glick is referring to Alabama’s artificial reef project, which began in the mid-1980s. With less than 4 percent of the Gulf coastline, that state went from no red snapper landings to hauling in 35 to 40 percent of the Gulf snapper catch each year, to enormous economic benefit, he said. Alabama’s reef is quite a bit bigger than what’s planned for RGV Reef though it’s all high-relief, meant to attract mature red snapper from neighboring waters, Glick said. In contrast, RGV Reef’s combination of high, low and medium relief protects snapper from predators from the juvenile stage through adulthood, he said. He said recreational red snapper fishing generates several times the economic force of commercial red snapper fishing, since people who come to fish also spend money on food and lodging, gas, tackle, charter trips, etc. Glick estimated that Friends of RGV Reef has spent about $400,000 on deploying reef material so far, but said the group has managed to do it for roughly $100 a ton as opposed to the more typical $700 to $1,000 per ton. Glick said the work so far wouldn’t have been possible without help from the Coastal Conservation Association-Building Conservation Trust, City of South Padre Island, Foremost Paving, Max Nichols, Port of Brownsville, South Point Marine, Texas International Fishing Tournament, and the marine science department at the University of Texas Rio Grande Valley, among others. EMR International Shipbreaking was a big help with deployments this summer, providing space for thousands of tons of reef material and loading it onto a Vietnam-era landing craft for transport to the reef site — all at a reasonable cost, Glick said. Glick said it’s taken three years of intense effort to get to this point. While it seems like it’s taken forever, the experts see the project moving rapidly, he said. Roxanne Harris, president and CEO of the South Padre Island Chamber of Commerce, said her organization has been working closely with Friends of RGV Reef, and that local sport-fishing captains, boats and businesses are excited about the reef project.